AS VEGAS – Nov. 3, 2015 – On Wednesday, November 4, 2015, at the BFGoodrich/SCORE outdoor display at SEMA‘s South Hall in Las Vegas, Shelby American will unveil its latest enhancement to the Ford family: all-new Shelby F-150 truck. For Ford F-150 truck enthusiasts, the Shelby F-150 brings a highly recognizable, classic Shelby bold appearance and over forty-five proprietary, high-performance enhancements including an optional supercharger that boasts 700HP. “Ever since Shelby introduced an upgrade to the 2011-14 Ford SVT Raptors and then ‘upgraded the upgrade’ with the 700+HP Shelby Baja 700 Raptor, our Customers have wondered what other truck enhancements we could create,” said Joe Conway, Co-CEO of Carroll Shelby International and CEO of Shelby American. The massive power comes from an optional supercharger that includes an oversized cold air intake, billet aluminum high flow throttle body, aluminum heat exchanger, higher flowing fuel injectors and an updated calibration. Muscle-car enthusiasts will appreciate the custom-tuned, black-tipped, Borla dual exhaust system that roars to match the power of the blower. As with every Shelby produced, a great deal of attention is placed upon controlling the enhanced horsepower, so Shelby engineers teamed up with Fox shocks and BDS Suspension to engineer a custom-tuned performance suspension only available on the 2016 Shelby F-150. It features four aluminum-body, Fox 2.5 inch Internal Bypass Reservoir shocks with Dual Speed Adjusters. This technology allows the driver to adjust for precise suspension tuning for high performance handling on any terrain or driving conditions. And speaking of driving conditions, the Shelby F-150 will feature 18-inch custom Shelby wheels paired with next-generation BFGoodrich All-Terrain KO2 tires specifically designed for off-road performance. Shelby will build these F-150s through a manufacturing and distribution partnership with select Ford dealers through Tuscany Motor Company, a 27-year Ford bailment and specialty vehicle manufacturer based out of Elkhart, IN. 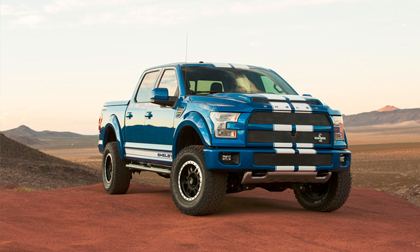 Shelby will only offer 500 of these Shelby F-150 trucks through a select network of Ford dealers. Customers are encouraged to visit the ShelbyF150.com website to configure one of the 5 color and stripe combinations for their truck including Black, Blue Flame, Magnetic, Oxford White and Race Red. The normally aspirated, 395HP Shelby F-150 starts at $85,495, but adding the 700HP supercharger brings the total solution to $98,995. More information is available at www.ShelbyF150.com or by calling (702) 942-7325. Founded by legend Carroll Shelby, Shelby American manufactures and markets performance vehicles and related products. The company builds authentic continuation Cobras, including the 427 S/C, 289 FIA, 289 street car and Daytona Coupe component vehicles; it offers the Shelby GT, 1000, GT500 Super Snake and GTS post-title packages for the 2005-2016 Ford Mustang. Shelby American also builds the Shelby Raptor and Shelby F-150 muscle truck. For more information, visit www.shelby.com. Flagship, Inc. dba TUSCANY since 1988 is the leading provider of specialty trucks. Tuscany enjoys bailment pool status with Ford Motor Company, allowing the company to order vehicle chassis directly from the OEM. Tuscany is Ford’s largest volume producer in the personal-use luxury truck segment. Tuscany is also a Ford Quality Vehicle Modifier (QVM), and the recipient of Ford Motor Company’s Quality Excellence Award for seven straight years — the only company to do so. Tuscany is the designer and manufacture of the FTX, BLACK OPS and TONKA brands on the F-150 and F-250. Learn more at drivetuscany.com.